I hope you all had a great weekend! We had a lot of action around here. If you want to see some comedy, head over to facebook to watch the little cooking class that Pia and Coco and I did for Halloween goodies. We wore costumes. It was definitely funny if you like a little chaos. Pia got her ears pierced (this is the third time by the way- we are hoping that her ears can handle it this time). Pete and I snagged a date night and we watched Sleepless in Seattle ( I forgot how much I love that movie- I cried like three times). Sunday I cooked alllllll day. It was Thanksgiving in October (I can’t wiat to share all of these gorgeous recipes with you for the Holidays!) and then I made my parents and brother and his wife come eat all of the food. I am still full by the way. And then, as of it were real Thanksgiving, we watched football while trying to digest. It was a great weekend. And one more highlight from the weekend is this recipe! I made these this weekend and everyone devoured them- the kids were sooo into these. They are really tender from the applesauce and then there are those nice little chunks of apple baked into the scones as well. They are all topped off with a sweet vanilla glaze drizzled over the top- delicious! Preheat the oven to 400 degrees. Prepare a sheetpan with a silpat or a sheet of parchment. Combine the coconut milk and the apple cider vinegar and set aside. In the bowl of a food processor combine the gluten free flour, the sugar, baking powder, baking soda, xanthum gum, kosher salt, cinnamon, nutmeg until well combined. Add the vegan butter and pulse until crumbly. Add the applesauce and the coconut milk combination and pulse until you have a uniform smooth dough. Transfer the dough to a lightly floured surface and gently shape into a disc. Slice the disc into 6 wedges and then transfer them to the prepared sheet pan. Poke the apple pieces into the scones. Rub the tops of the scones with the 1 tablespoon of coconut milk and then sprinkle the tops with the tablespoon of sugar. Bake the scones for 12 minutes until golden brown. Let the scones cool slightly. Whisk the powdered sugar and vanilla until smooth and drizzle over the scones. Serve immediately. These looks oh so scrumptious! Please forgive me if I’m being an idiot, but is step 5 supposed to read ” Add the coconut milk and apple cider vinegar” from step 2? I can’t find a step where applesauce and coconut milk were mixed together beforehand, and can’t wait to try these! Sorry if that is confusing Stephanie! You just add it to the bowl separately- you don’t have to add it to the applesauce! I am going to make these on Facebook live today too! I will put the link in this post. 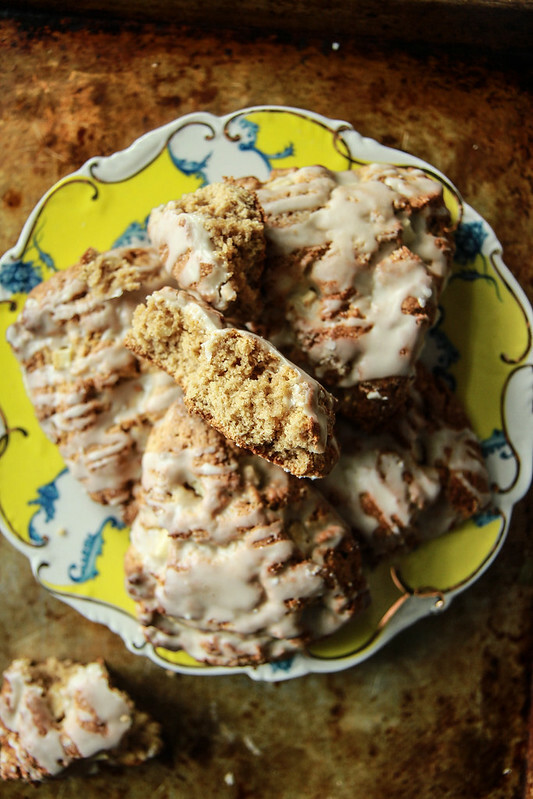 Gorgeous Fall Scones! Love these flavors! Thanks Jenny! Me too- it’s probably my favorite fall combo! Looks delish! Can you tell us which coconut milk you used? Thanks! Yes! i use Trader joe’s unsweetned from a carton for these! Good luck with those ears miss Pia!!! 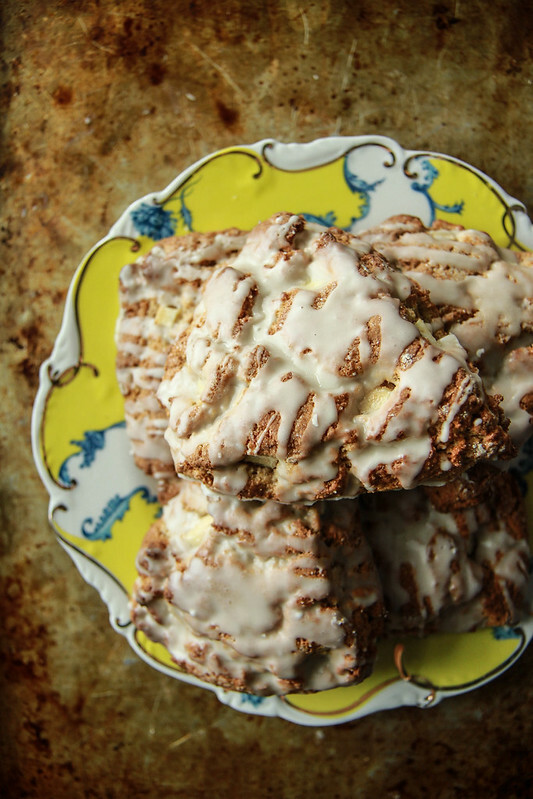 These scones would be perfect with my afternoon (or morning) coffee! Hope Pia’s ears do better the third time around!! 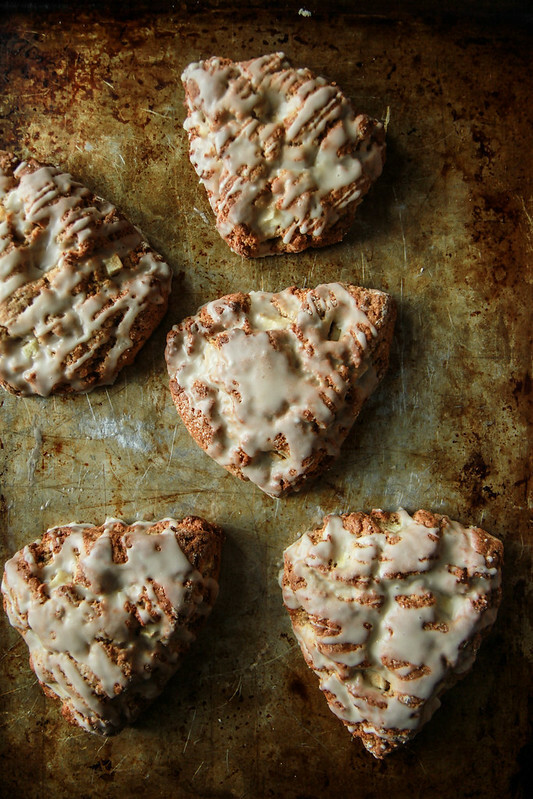 These scones look lovely and I love the apples! If my GF flour mix already has xantham gum in it do i omit the 1/2 tsp? These look wonderful, I can see myself eating these with a nice cup of coffee for breakfast. I love anything apple cinnamon. YES! So good with coffee Celeste! I so want to devour these scones too. Gorgeous! Heather, how do I save coconut milk when the recipe calls for so little. I’ve tried freezing it but that didn’t seem to work. I buy the smallest canned coconut milk I can find. Hi Barbara- we usually use the coconut milk from the carton that is refrigerated and then use it for cereal, or I use it in my tea or my favorite- in smoothies! If you want to freeze it, you should try in ice cube trays if you only use a little at a time. I made these scones and they were wonderful! However, that was too much sugar and vanilla for me in the glaze so I used two teaspoons vanilla and enough almond milk to get a drizzly consistency when whisked into 1/2 cup powdered sugar. They lasted two days and I ate them all myself. Yum!! Og good Linda! Thank you! I watched your video on how easy it is to make these and I’d love to try them. They look absolutely delicous and gorgeous. I just have a question can I use normal butter in these? If yes, would it be the same amount? Hi Mia! yes, you totally could and it would be the sam amount! Would i be able to use almond flour instead? Hi Diana, I have not tried that, but Almond Flour on it’s own probably won’t have the structure of the gluten free flour. If you try it, please let me know how it turns out!